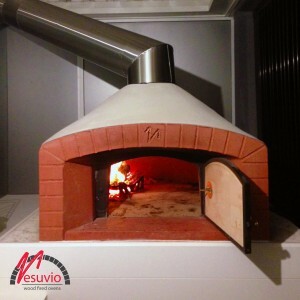 This is a fine finished versionb of the TOP 100 Valoriani wood fired oven imported in Australia by Vesuvio. It will definitely add style and charm to your backyard or garden with the rustic-chic mosaic finishing . The owner chose soft colours that match with any kind of furniture and enhance the natural light. It’s ideal both for suburban and inner-city spaces, to enjoy Al Fresco dining all year long. 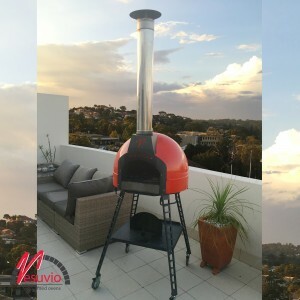 This Baby wood fired oven from Valoriani is ideal for balcony use. The owner chose the standard edition with a stand and castors to allow for it to be moved around accordingly. It’s ideal for inner-city entertaining and the owners can take the oven with them if they choose to relocate. 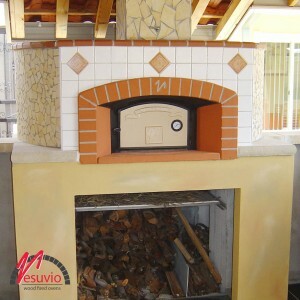 This Top100 wood fired oven from Valoriani is neat and simple, finished with a smooth render and sand colored paint. 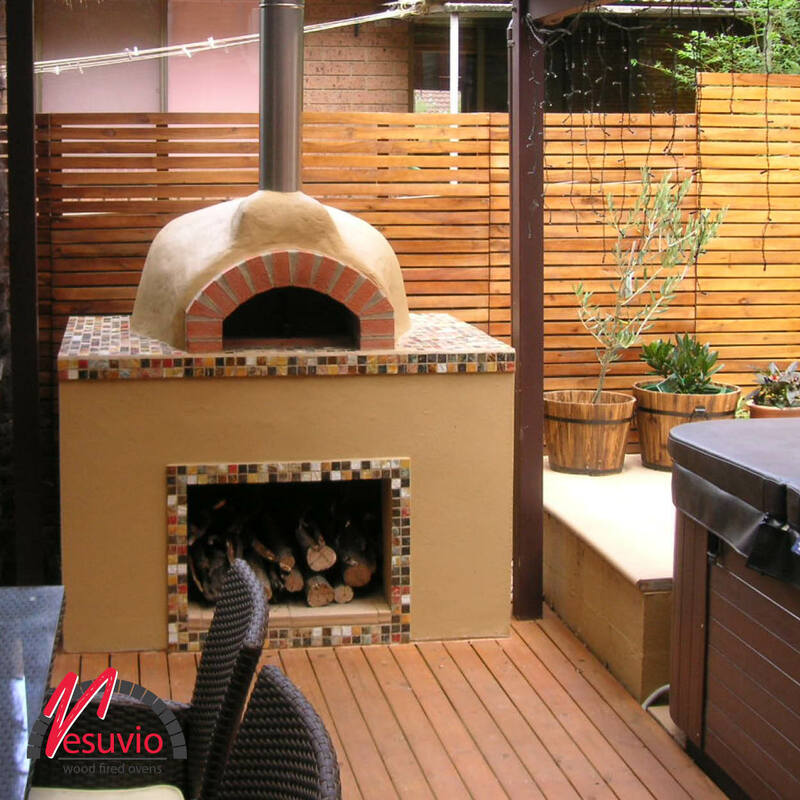 It’s installed under a pergola with an angled flue to expel the smoke in the desired direction and to avoid having to go through the roof. Just because your wood fired oven is built from traditional materials it doesn’t mean it doesn’t suit a modern home. This brilliant outdoor kitchen combines stainless steel appliances and storage doors with stone bench tops and earthy tones. The smooth rendered finish has been painted to suit the rest of the kitchen resulting in this exquisite entertaining area fit for the modern at-home chef. What better way to cook food than to do it in the great outdoors with the most traditional methods? 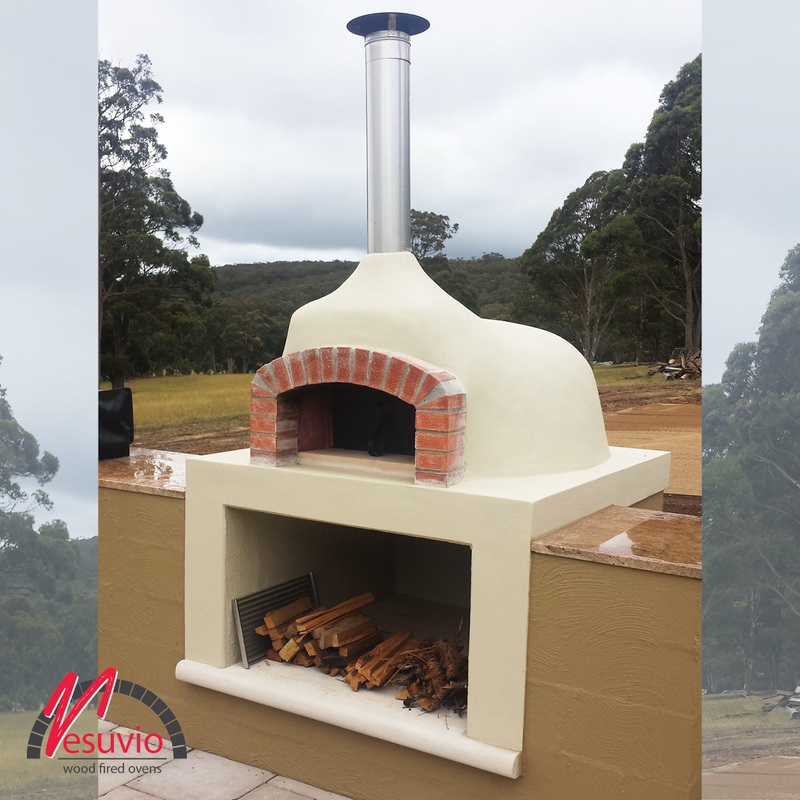 This oven is finished with a simplistic smooth render and painted in earthy tones to reflect the surrounding landscape. With a great granite work bench and fire wood storage underneath these wood fired ovens are both practical and aesthetic. 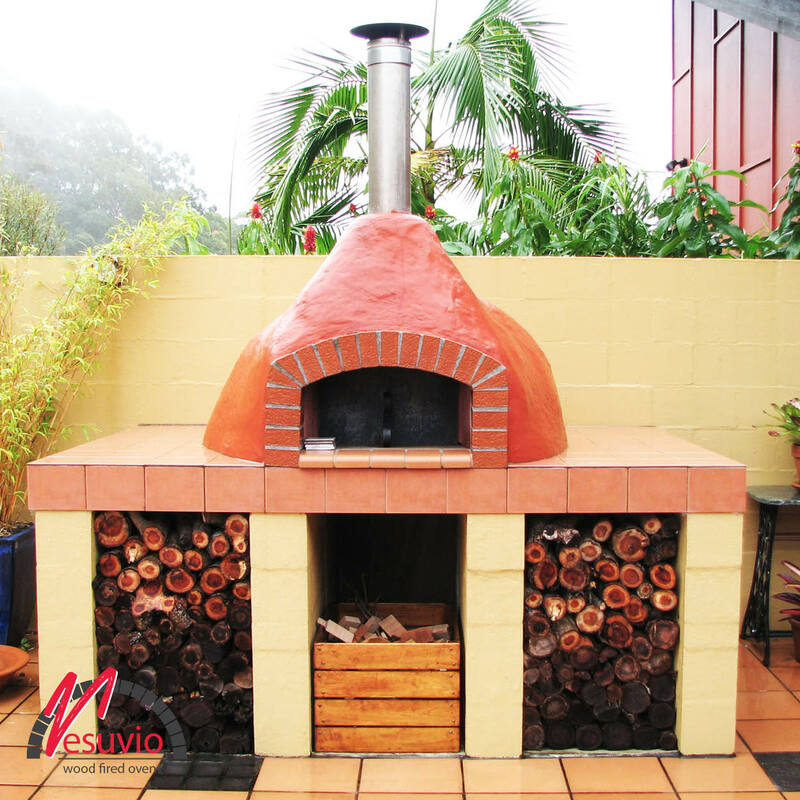 Australian summers will now be complete for this family with this wonderful addition to their entertainment area. 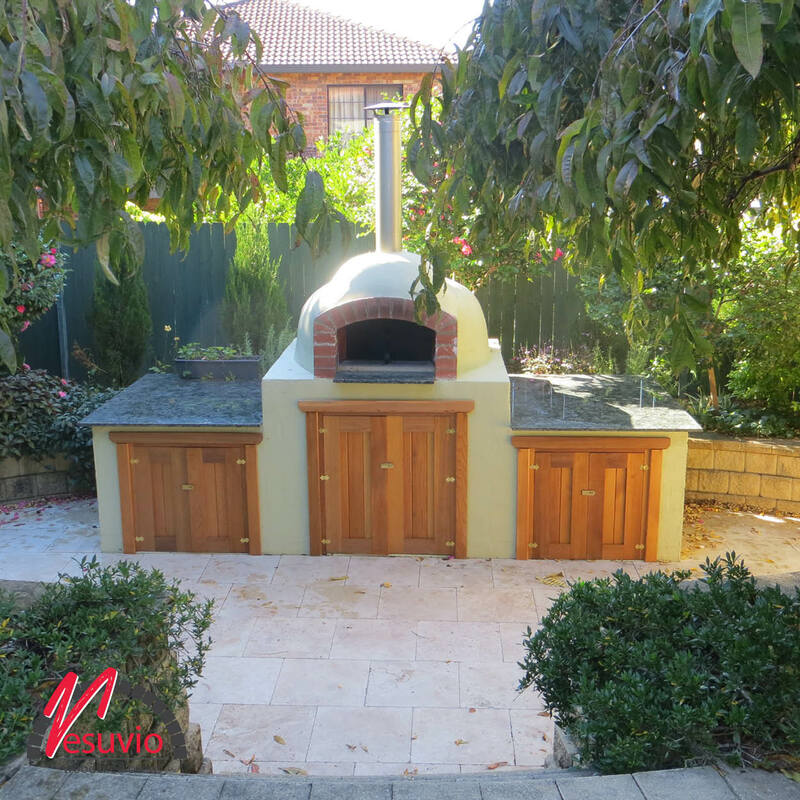 Nestled among the trees is this cooking courtyard with work benches either side of the wood fired oven finished with fine granite and timber doors to the storage areas. 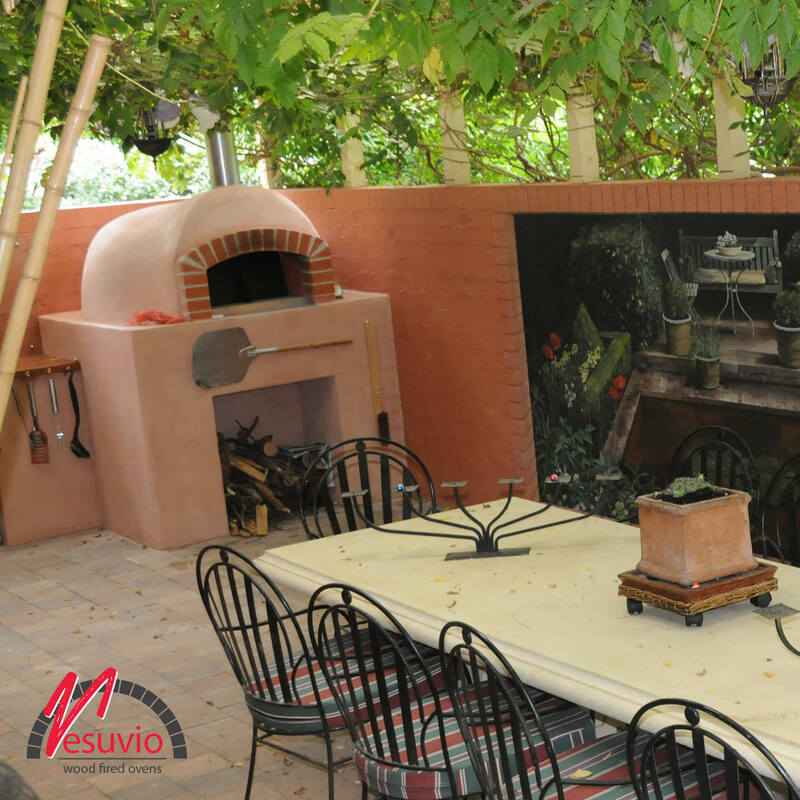 The beautifully landscaped surrounds make this courtyard area a sanctuary for perfecting the pizza of your dreams or to gently roast a culinary masterpiece to amaze your family and friends. 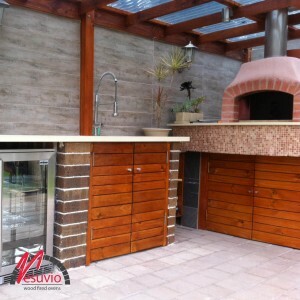 These wood fired ovens are the perfect feature in this al fresco outdoor kitchen area. The mixture of slate tiles, shale and black and white gloss mosaics gives a great contrast of textures and makes the oven just pop. This area is truly inviting and the kitchen is equipped with bi-fold doors opening to this area to merge the indoors with the outdoors for the perfect entertaining area. This wood fired oven is the perfect company for the barbecue in this indoor/outdoor kitchen. The black granite bench tops and modern laminate doors make are illuminated by down lights and the oven is finished with a natural stone mosaic. 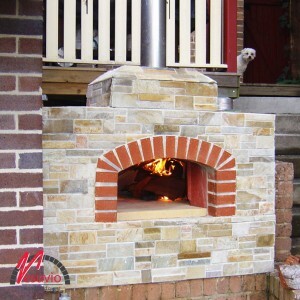 This simple, yet commanding woodfired oven is accentuated by subtle landscaping techniques. The traditional rendered base is surrounded by a moat of pebbles set off the decking slightly. 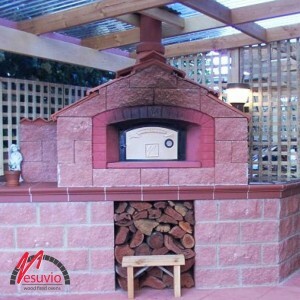 If you can’t decide where to put your wood fired oven then why not make it portable. This oven has been set on a base which not only holds the fire wood but also has wheels to move it into a position that is most convenient for your current entertaining needs. Finished with a simply elegant terracotta tile and dark stained wood, this wood fired oven trolley is both functional and aesthetic. 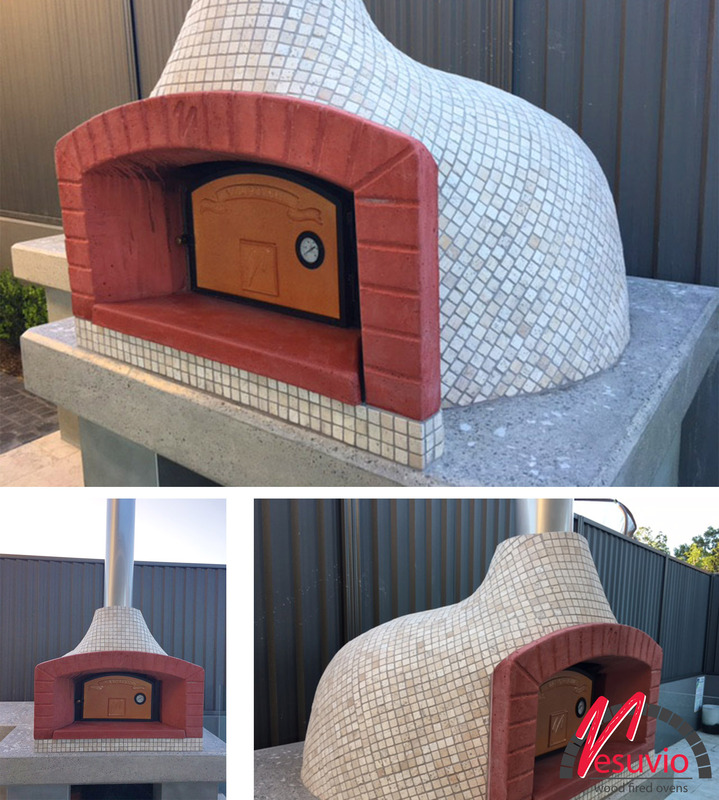 This wood fired oven, set on a speckled granite work top with a black painted arch, is fitted with a gas boosted meaning it can run off wood or gas or both at the same time. This dramatically decreases the warm-up time. This indoor wood fired oven shows just how an oven can be a feature whilst still complimenting the surroundings. 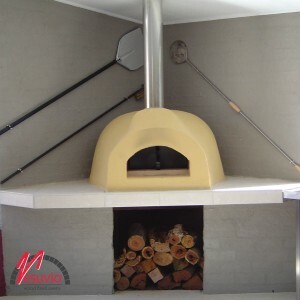 The flue is easily installed to pass through the roof and the arch has been rendered to match the body of the oven. When summer calls you are spending entire weekends by the pool, you don’t want to leave pool-side just to eat. A wood fired oven is the best way to be entertained an fed whilst not too far from the waters edge! 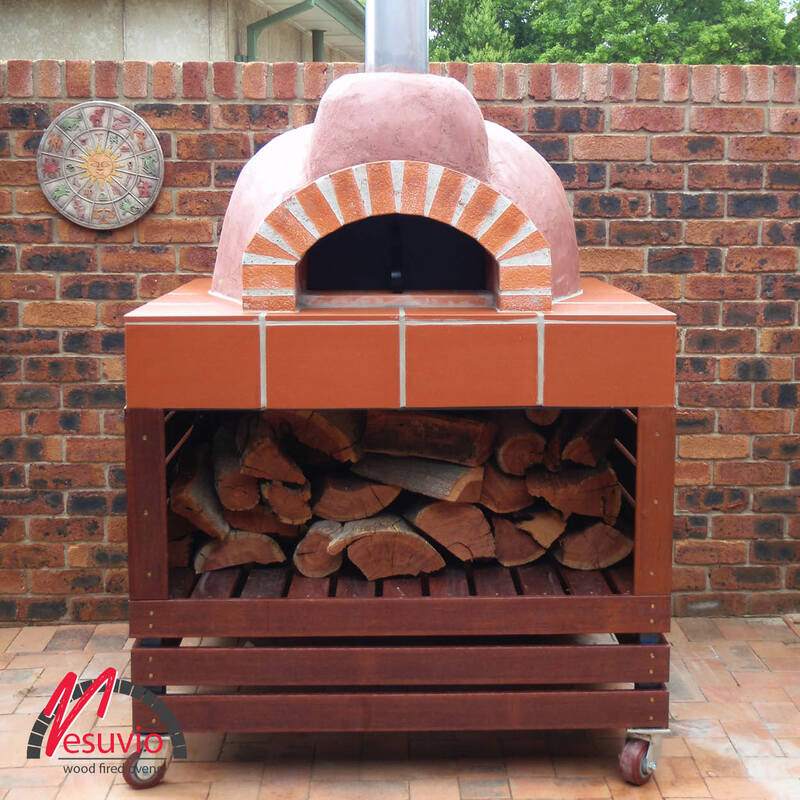 This oven doesn’t take up too much room and is finished with a basic cement and render base. This tiled courtyard is completed by this wood fire oven set on a work bench and finished with terracotta tiles. 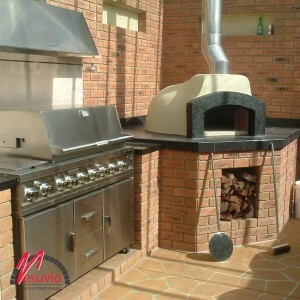 The body of the oven is painted in a gloss paint for that extra impact. 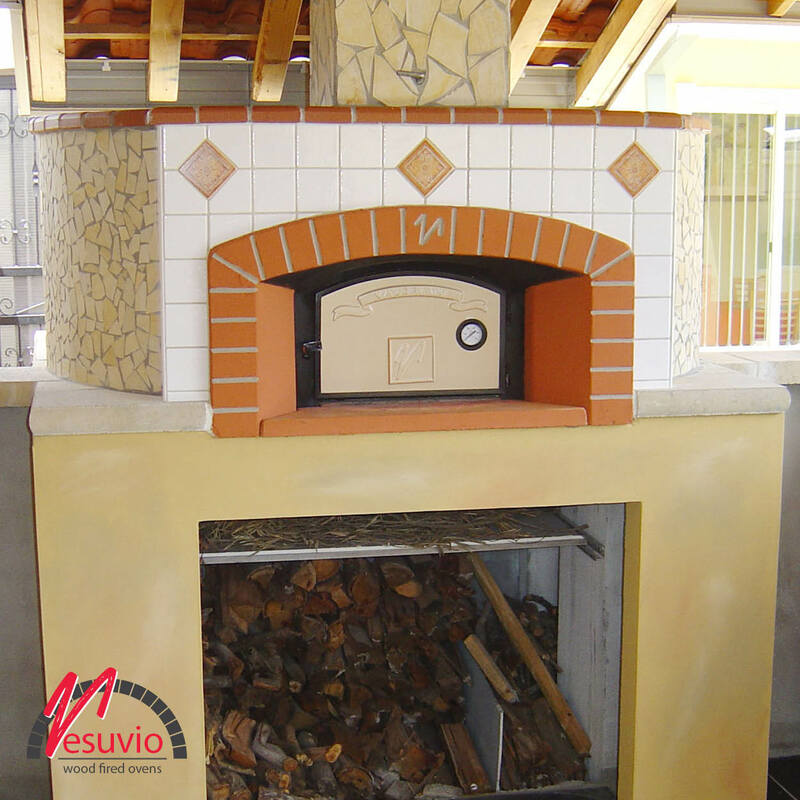 The perfect home pizzeria is only complete with a Vesuvio wood fired oven, pizza dough racks and a nice large preparation area. 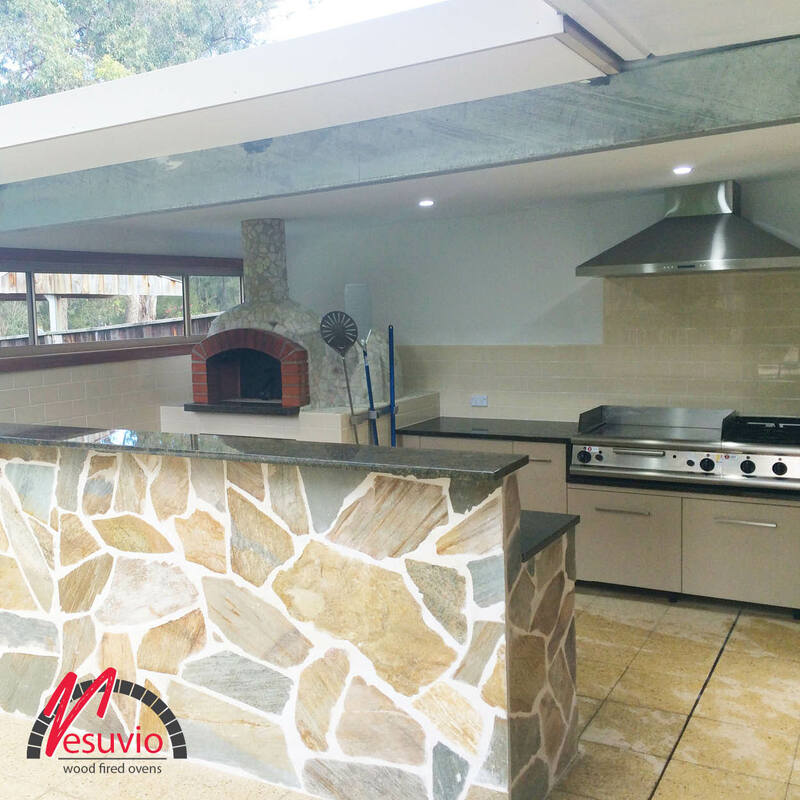 The whole family can gather around this space and create their own master piece, but I have a feeling that the home owner of this wonderful kitchen takes a lot of pride in preparing food for his family and guests. The body of this oven is left naked and the wood is beautifully concealed by a wooden hinged cupboard door that compliments the entire area. 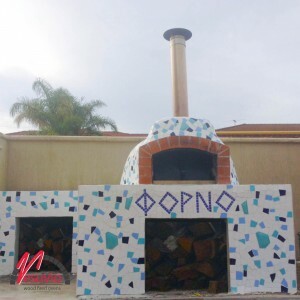 This woodfired oven is decorated with a greek flare and plenty of room for wood storage and food preparation. 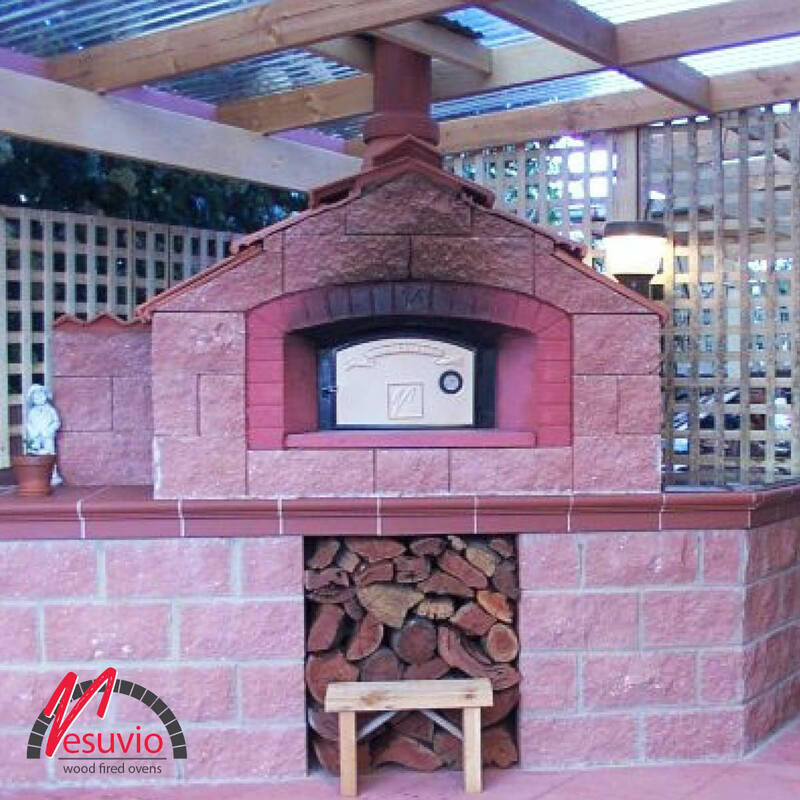 Even the most suburban Australian home can have a touch of Europe in the back yard with a Vesuvio wood oven. 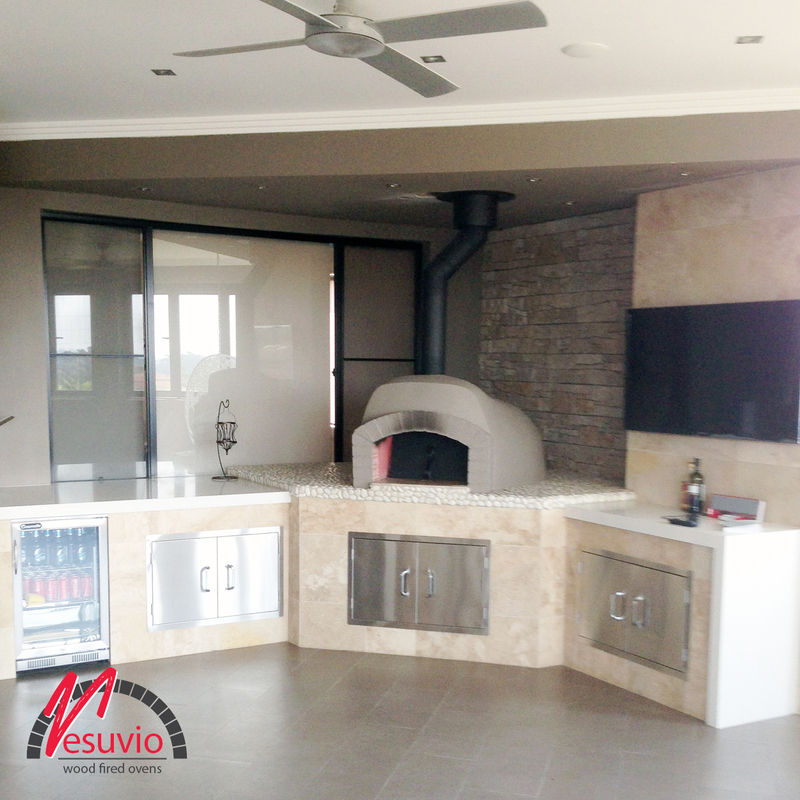 The natural stone tiles give a great detailed texture to the base and is complimented by the smooth plain painted dome of the oven and fire wood is hidden away behind neat timber doors. This family home is ready for some delicious shared meals all summer long and even into winter! Attention to detail was a priority when creating this outdoor woodfired oven setting. The oven has been encased in a box, with rendered base, and finished with a granite benchtop. The fascia has been tiled and the use of the terracotta colour has been complemented by the terracotta oven roof and feature tiles on the oven fascia, whilst mosaics have been used around the oven and flue. The stone mosaics are also featured around the pergola walls and floor. 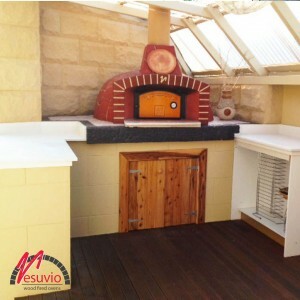 This wood fired oven has been built flat into the wall with a sandstone surround, resulting in this stunning finish. The sandstone finish complements the heritage style of this home and the sandstone features used throughout. 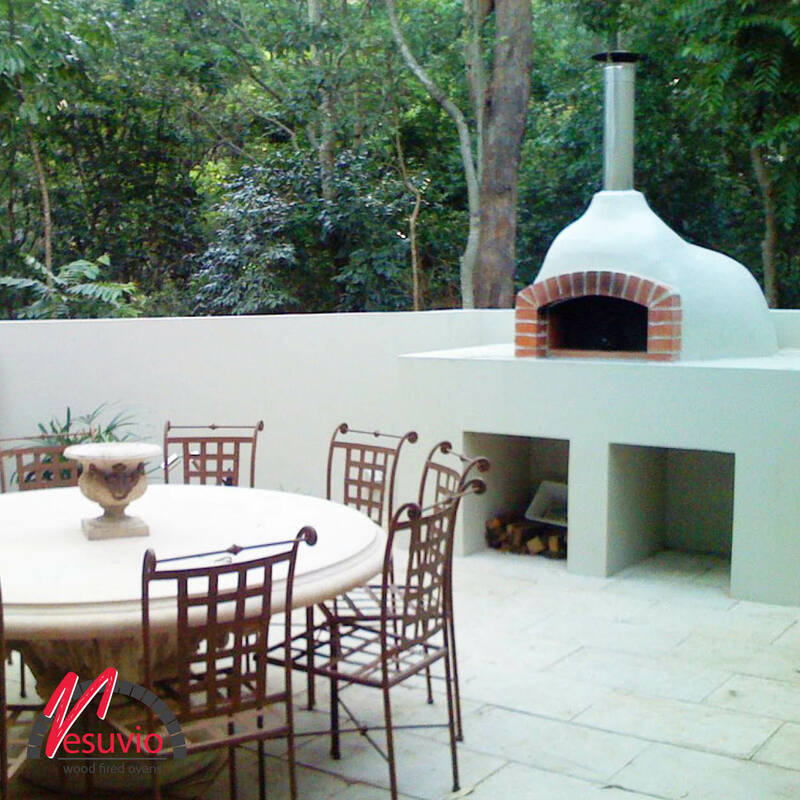 This woodfired oven has been constructed in the traditional dome shape and blends perfectly into this outdoor living space. 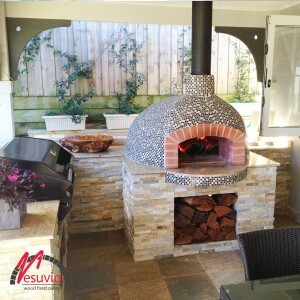 Constructed on a rendered brick base, and complemented with an earth toned mosaic tile palette, that extends from the built in wood storage area to oven surrounds, this wood fired oven seamlessly connects the indoor and outdoor living spaces. 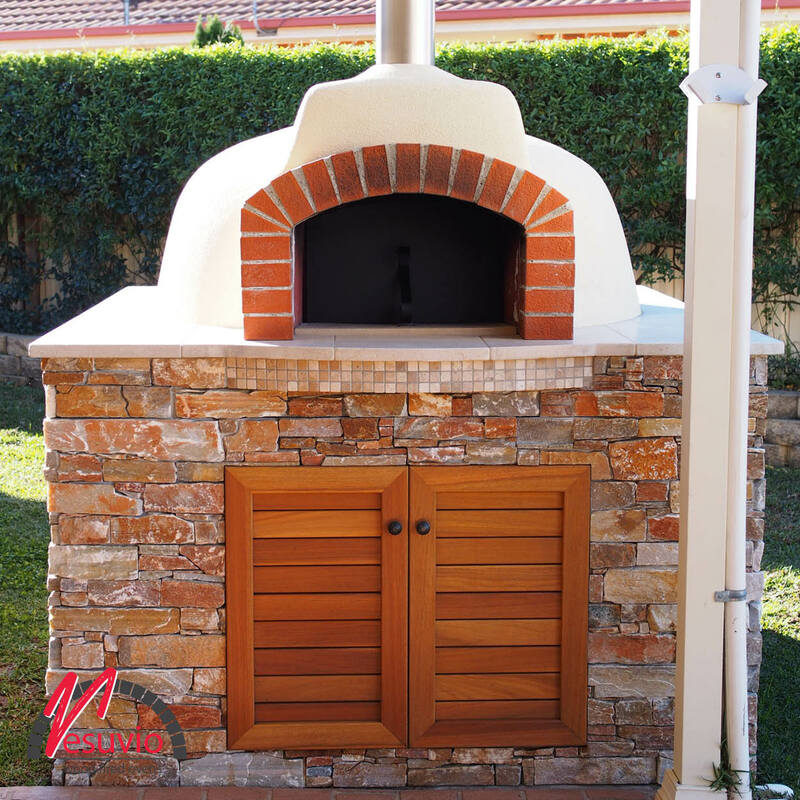 Incorporated into a modern outdoor kitchen which is finished with timber doors, stainless steel appliances and granite bench tops this wood fired oven blends a touch of Italian tradition with Australian modernism. The embellished wall, and wonderful rustic feel, evokes fond reminiscences of a Tuscan villa. Simple and elegant, this woodfired oven blends in perfectly in this outdoor oasis. The classic rendered finish in traditional terracotta adds to the authentic charm of the wood fired oven. A Mediterranean influence is revealed in this contemporary garden with classic sandstone featured throughout and continuing to the focal point which is the Vesuvio Wood Fired Oven. Dome shaped and rendered in a soft natural shade, this oven provides a simple elegance in a sophisticated alfresco setting. Rustic furniture and a soft colour palette transforms this alfresco setting into an elegant and formal area which is totally functional. 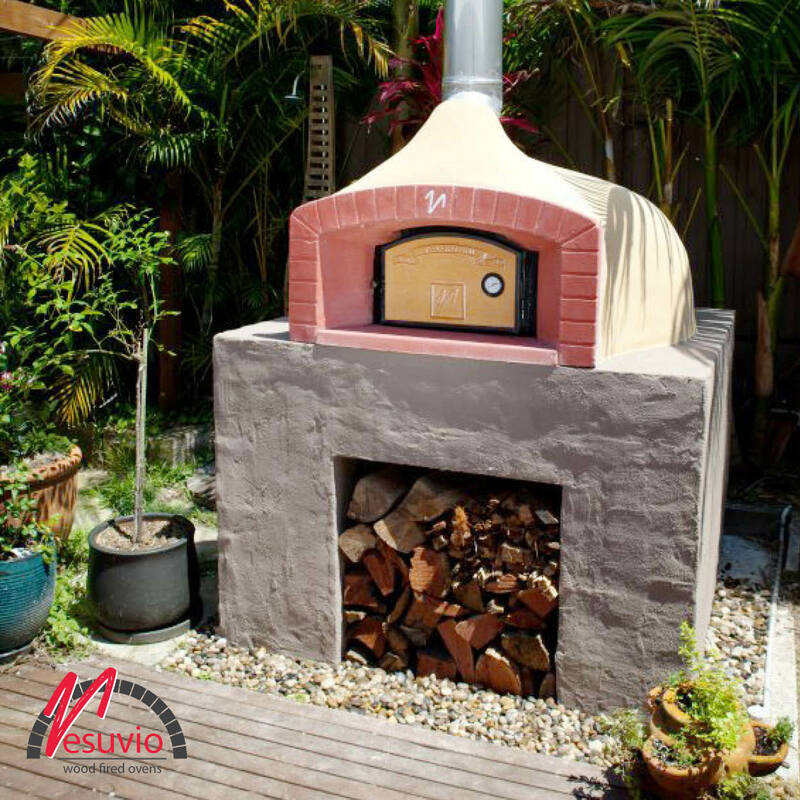 Conjuring thoughts of a tranquil Mediterranean hide away, this rendered wood fired oven is supported on a double base, allowing plenty of wood storage and work space. 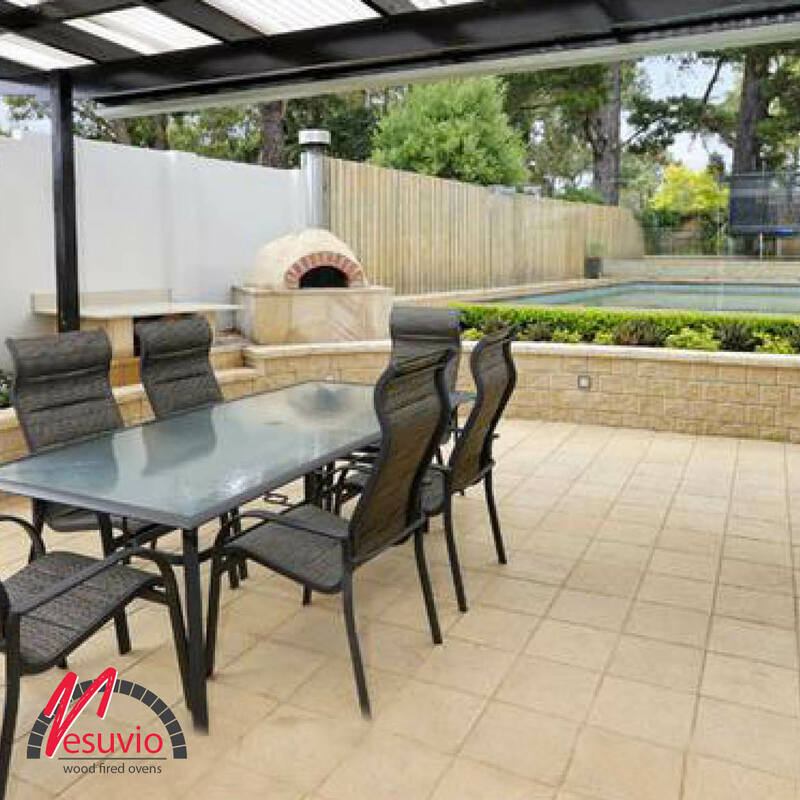 The perfect fusion of traditional and modern cooking methods, are used in this alfresco dining area, to create a year round retreat that is the height of style. 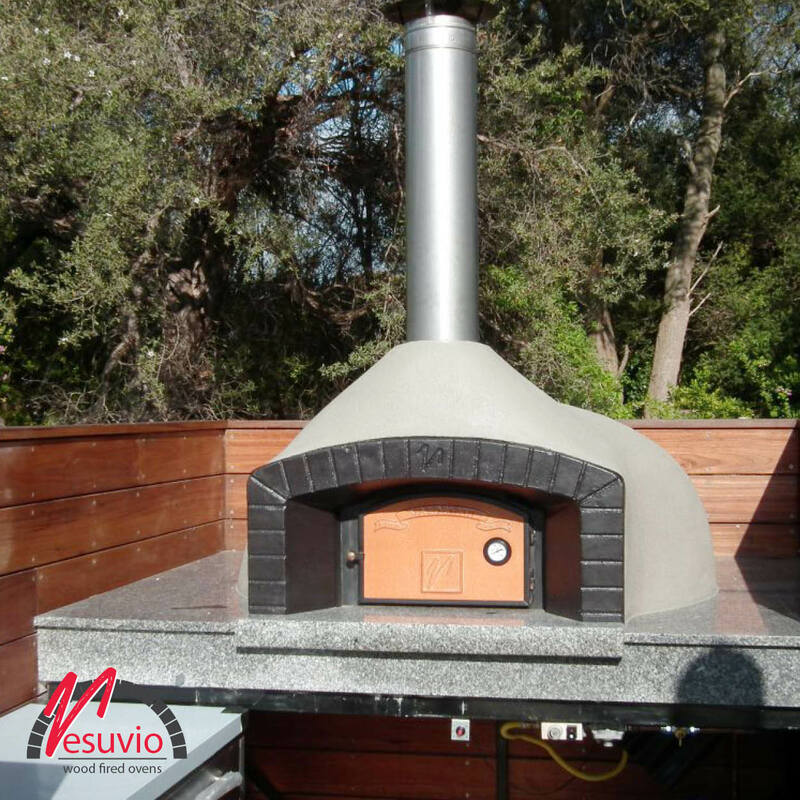 The wood fired oven and surrounding workspace is finished with black granite and the flue extension allows the oven to extend through the roof of the alfresco area. 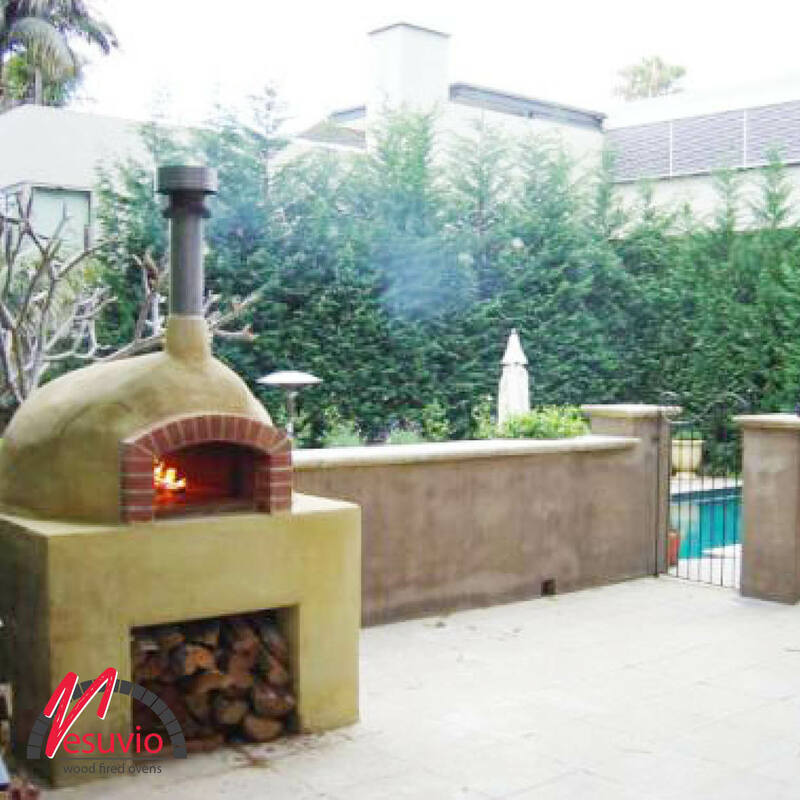 This woodfired oven is situated under a pergola area. Classic wallstone solid blocks in rich terracotta, with a terracotta tile benchtop and roof, have been used to create the finish to complement this pizza oven.